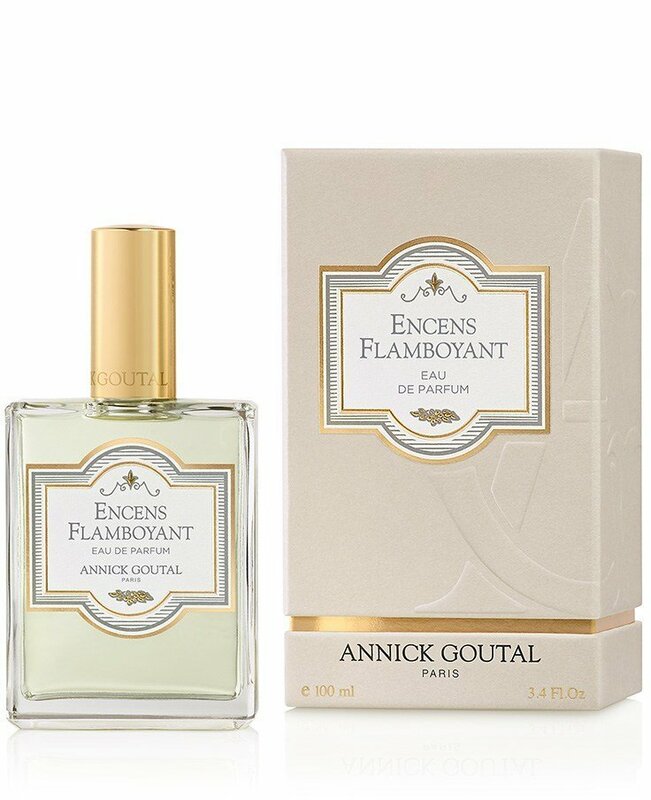 Encens Flamboyant (Eau de Parfum) is a popular perfume by Goutal / Annick Goutal for women and men and was released in 2007. The scent is smoky-woody. It is being marketed by AmorePacific / 아모레퍼시픽은. "The Abbey in the Eichwald"
Annick Goutal's scents fascinate me again and again; also because they tell stories. Sometimes even because they tell me my most personal stories. "I got to know "Encens Flamboyant" because FvSpee drew my attention to it after my comment on "Ambre Fétiche". At this point thank you very much! First I wanted to be satisfied with a filling of the fragrance - it's worth getting to know it. But then it turned out that my "favorite" perfume mail order company on the Internet offered a large batch of it and so I could buy a bottle for little money. FvSpee almost had a guilty conscience when I mentioned this purchase to him; that doesn't have to be! We both, Encens Flamboyant and I, are very happy with each other. In contrast to the "Ambre Fétiche", this fragrance first appears "grey". The golden glow that amber always brings with it is missing; also this fragrance has a certain sacral note: the memory of an empty church is not so wrong here. This felt "grey" led me directly to Caspar David Friedrich and his painting "The Abbey in the Eichwald". Friedrich, one of the famous German Romantic painters, created this work in 1809. As with the pendant "The monk by the sea", the subdued atmosphere dominates: the remains of the monastery Eldena, the open grave and the winter are symbols of transience here as well. I remember very well how I got to know the works of this painter as a young woman in the early seventies. The entire area around Charlottenburg Palace had finally been restored, including the Schinkel Pavilion. Karl Friedrich Schinkel built this summer house in 1824/25 for King Friedrich Wilhelm III of Prussia and his second wife Auguste Fürstin von Liegnitz, married in a morganatic marriage in 1824, on the edge of the castle park, directly on the Spree. This is still a nice place today. It made sense to choose this place; Potsdam, for example, would not have been quite so suitable, despite the many lakes. For the Berliners idolized Queen Luise, who died in 1810, and did not quite agree with a remarriage of her king, who was very bourgeois. I think, at that time the hype around this woman must have come close to the "star cult" Lady Dianas of England. The name "Queen Luise" alone still today makes many people, especially women, rave. In this airy, classicistic building the works of C. D. Friedrich were always a little out of place. There the paintings of Eduard Gärtner, Franz Krüger (also called "Pferde-Krüger": because of his huge pictures of parades with many people) and Karl Friedrich Schinkel were much more fitting; it is a summer house. In the meantime, almost all of them are hanging in the Old National Gallery on the Museum Island with the other Romantics; there, Friedrichs pictures seem to feel much more comfortable. I'm already impressed by this man's work, but I don't like the general choice of themes so much; actually I'd like to call it "Bonjour Tristesse". But once again this is something I'm not allowed to say out loud; quickly the evil word "Kunstbanause" falls! Although "Encens Flamboyant" just reminded me of this painting that I had almost forgotten, there is nothing gloomy or sad about this scent, but rather something contemplative about it. Incense in many variations forms the basis here; I love incense and therefore we already understand each other very well. Church consecration incense makes me stop and through it I notice clearly that a fragrance does not always have to spread cheerfulness and merriment. He may also invite to think, to reflect! Sharp, freshly ground black pepper and its aromatic pink companion set certain light signals: they ignite a fire in this Gesamtkunstwerk! A fire that burns warm and without flickering, bringing the spice of the different resins and the fir balm to life. These quite strong ingredients let this fragrance vibrate quite easily. A not insignificant pinch of nutmeg provides an additional aroma boost; this is how "Encens Flamboyant" is skilfully rounded off. With "Encens Flamboyant" Isabelle Doyen and Camille Goutal (who by the way took over the stage name of her mother Annick) have succeeded in creating an unusual and extraordinary fragrance work of art. This fragrance is not suitable for every day and certainly not for every person. It takes a little courage to be surrounded by smoke with a slightly sacral touch. Sillage and durability also correspond here to the experiences made with most scents of this house. Also "Encens Flamboyant" becomes lighter and finer in the course of time, until only a delicate nuance of incense (as it hangs in the clothing after a church visit) remains. I have often worn this scent during the last, but quite hot days; I just felt comfortable with it. I will not question this sympathy; I know myself too well not to know that I find here, in a certainly unusual way, the inner peace that I have often lacked in recent times. And that's good! For this reason alone I am very grateful to FvSpee for his recommendation and believe that the 100 ml that the classic clear glass bottle encloses will accompany me "to the bitter end" (how do I get to Johannes Mario Simmel now?). This one is very nice. An incense which has a lot of "forest" type notes. I can pick up birch wood and fir balsam and a host of other notes. This really reminds me of the very good incense perfumes I've smelled before. I really enjoy it. 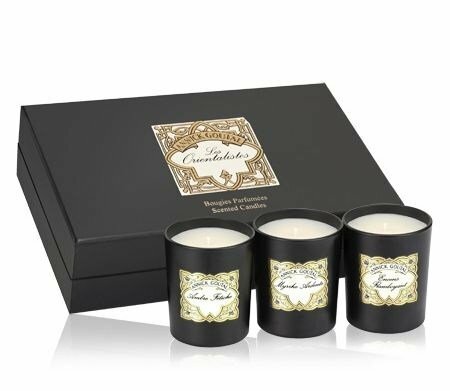 I have enjoyed many of the perfumes in the Les Oreintalistes series from Annick Goutal. This one is no exception. Recommended for lovers of incense fragrances. An incense perfume, with a thick and peppery opening. Somehow I expected it to be sweeter. Not so. This is a lovely brooding incense with fir, cardamom and -o bliss ! !- a sweet hint of red berries. For once I am happy a scent -which I really love- is not at all heavy in sillage (be sure: I sprayed and sprayed again). It probably would have been too much if it were. Being as mild in sillage as it is, I find it absolutely delicious and bewitching at the same time. A combination of two adjectives quite applicable in general to Les 4 Orientalistes. Women have no business smelling like the inside of a medieval cathedral, damp from the rain. Or do they? There seem to be tons of incense perfumes by now. I have the Comme des Garçons Incense series, which covers a lot of dry incense ground. 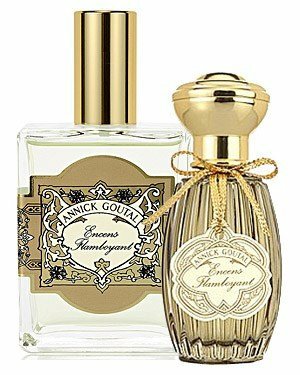 Annick Goutal ENCENS FLAMBOYANT offers a new twist on incense: dampness. Never has a perfume reminded me more of the scent of the inside of a medieval cathedral after a rain. So, yes, I'd call this a novelty scent. Do I want to smell like the inside of a medieval Catholic church all damp and musty, like cold concrete and stone mingling with purple smoke? Not really, to be honest. Perhaps ENCENS FLAMBOYANT would work better for the gents, although I wonder whether it might morph into some sort of body odor scent. Probably depends on the guy. Try before you buy. In any case, I enjoyed the memories elicited by this perfume, of my trips around small towns in France where I invariably dropped in for a visit to the local church or cathedral and often smelled something like this scent lingering in the air. It's odd, I suppose, that an agnostic should enjoy visiting the cathedrals of France. I also like cemeteries and catacombs, perhaps for the same reason. Encens Flamboyant is supposed to be the most incensey fragrance in the series, however I'm not feeling it. This fragrance is much more subtle than Myrrhe Ardente and Ambre Fetiche. Despite its lack of incensey goodness, this fragrance makes up for it with its unique blend of pepper, woods and smoke. I totally get the 'Christmassy' feel that some reviewers have pointed out. The combination of spice and fir, is like scent recognition for me, it's Christmas in December all over again with every sniff. In some ways, Encens Flamboyant is musty, but not in a bad way. Its mustiness is what adds to its mystery, like an old, forgotten room, locked up for decades. Encens Flamboyant often strikes me as being an aromatic, as I sometimes find myself dazing off into space when I casually smell it every now and then. Although I do find this fragrance unisex, I'm more likely to recommend this fragrance to men more than women, however I haven't managed to pin-point what makes this fragrance more masculine than feminine to my nose. Being mostly dry, yet occasionally musty and damp, Encens Flamboyant is a very unique fragrance indeed. It is certainly worth checking out, even if you don't think it would be your type of scent. These Les Orientalistes fragrances are masterpieces that will hopefully be sold for many years to come. Write the first Review for Encens Flamboyant (Eau de Parfum)!